Last week there was a fascinating conversation on the notion of Utopia at the National Library of Australia. The conversants were the philosopher Peter Singer, the writer Alexis Wright, and two historians Russell Jacoby and Jacqueline Dutton, along with Paul Barclay from ABC’s Big Ideas. 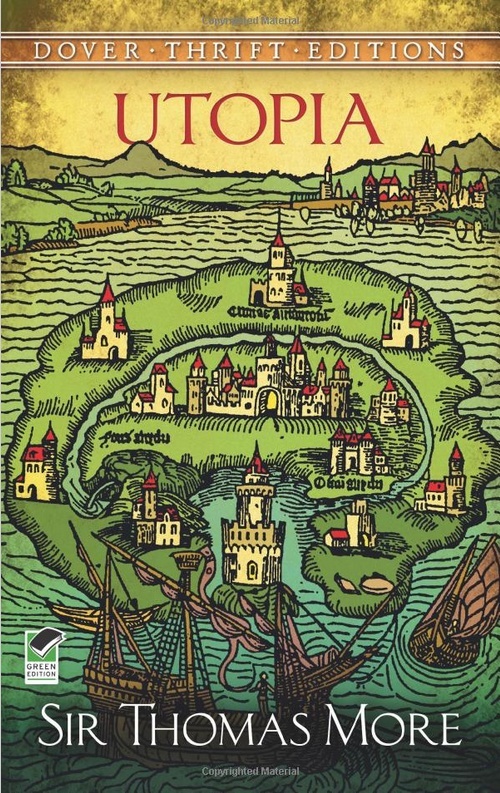 It is now just over 500 years since Thomas More published Utopia. Despite going in and out of fashion as an idea it is an idea and a word that has persisted. “It has legs,” as Russell Jacoby quipped. The purpose of this short reflection is to take up some of the themes of the discussion as well as some of the things that were unsaid, and to think about their implications for current action by Christians in the world. There was a point during the conversation that Alexis Wright was asked whether there was an Aboriginal equivalent of the idea of Utopia. After a thoughtful pause and with further thoughtful pauses she answered No. … For her mob life was intricately tied to the land in which they lived. … They had lived here so long. … Her people were realists. A hole seemed to form in the conversation, as the other conversants considered this response. It was hard to reconcile, perhaps impossible, with the theme of the evening’s gathering. Then the conversation moved on. Later, another hole opened in the conversation. Alexis Wright had just finished describing how her book Carpentaria was in many ways about hope. This led Peter Singer and Jacqueline Dutton to recount ways in which, despite the difficulties of the current time, there were reasons to be hopeful. Peter Singer recounted the statistics that indicated that at a global level poverty was getting less, there was less violent death and so on. There was a look of consternation on Alexis’ face. She did not say it, but anyone who has read Carpentaria knows that this is not the sort of hope that is described in her book. The characters in Carpentaria are in many ways deeply disadvantaged and living in a Dystopia that has been forced upon them. For them to find hope is crucial for survival. It must be built, created and maintained in the face of great difficulties. It is far removed from the optimism and statistics of the privileged. This discrepancy in world views was further alluded to when the historians described how difficult it was for their mostly privileged students to imagine a Utopia. Their efforts largely ended up sounding very similar to what it was like for them now, but with less traffic and cleaner parks. Not needing radical change for themselves, it was hard to imagine it. Without a certain type of adversity, radical change is not considered. Jesus, predating Thomas More by 1500 years, did not talk about a Utopia. Instead he talked of the coming and already present Kingdom of God. Jesus was a realist and like the Aboriginal people described in Carpentaria he was living in a dystopian society (at least from the point of the Jews, women, the poor and the outsiders). His imaginings challenged his followers to create the new society here and now in local communities that embodied the life of the Kingdom. They certainly weren’t perfect communities as the Gospels and other New Testament writings attest. They were plagued with all sorts of problems and many communities probably didn’t last long. Yet they were immensely radical and for brief periods people saw and experienced what it was like that there was no distinction between Jew and Greek, rich and poor, male and female: all were valued citizens of this Kingdom of love. They were exciting places to be in. In the West, Church communities are in decline. In some ways this is a good thing as Christianity loses the trappings of a Christendom that too closely associated itself with State power and identity. However, a problem remains for progressive Christians, “How are we to imagine and enact a community today that enlivens the new relationship of inclusivity that we find ourselves in?” Sometimes I think we find ourselves in the same position as the privileged students trying to imagine Utopia. Because our need is not great, our vision is too narrow. Perhaps it is only when we identify with and listen closely to the most disadvantaged and vulnerable in our society that our vision is opened to new ways of seeing, to new possibilities and to new critiques of the status quo. This is not an easy road, nor indeed a safe one. In recent years one of the ideas put forward by Christians is the importance of working for the “common good”. While I agree with this idea and try to work towards it, it feels bland. It lacks the excitement of a life lived fully and inclusively. It lacks both the highs and lows of working for justice with compassion, and the ongoing surprise as we engage with others and the physical world. It’s too noble, too utopian. It misses the messiness of life. Thomas More, a committed Christian lived in messy times and felt compelled to act politically in those times. Looking back, most of us would feel that he made mistakes, had shortcomings both in his life and his writings. Yet there is something about him that remains attractive across the spectrum. He has been canonised by the Roman Catholic Church as well as being honoured by Lenin. Despite opposing Luther during his lifetime, he is honoured by the Church of England as a martyr of the Reformation. More is attractive in part because he engaged with life and he also richly imagined a future better life. While certainly he wrote Utopia from a privileged position, he was also prepared to set aside that privilege in the pursuit of his idea of the better society.